Sumgayit club has made its first transfer within interval breaks. 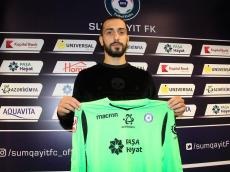 Report informs citing the official website of the club, a 1.5-year contract was signed with goalkeeper who has left Neftchi FC Rashad Azizli. 24-year-old goalkeeper will wear uniform with number 12. Notably, during his career, Rashad Azizli played for the success of "Neftchi" (17 games), "Simurg", "Ravan" (16 games) and AZAL (2 games). He also played in U15, U17, U19 and U21 the national team of Azerbaijan.